debugout "about to open database"
debugout "about to open table"
debugout "no need to log this"
** Total of ** 15 variables defined and 1680 bytes used. dialog box "The line is # &m_lineno." dialog message "The error occurred in the procedure &m_procname." Lianja.exe crashed with a stopped responding windows message error box, there were no error numbers. When restarted the home screen is blank. 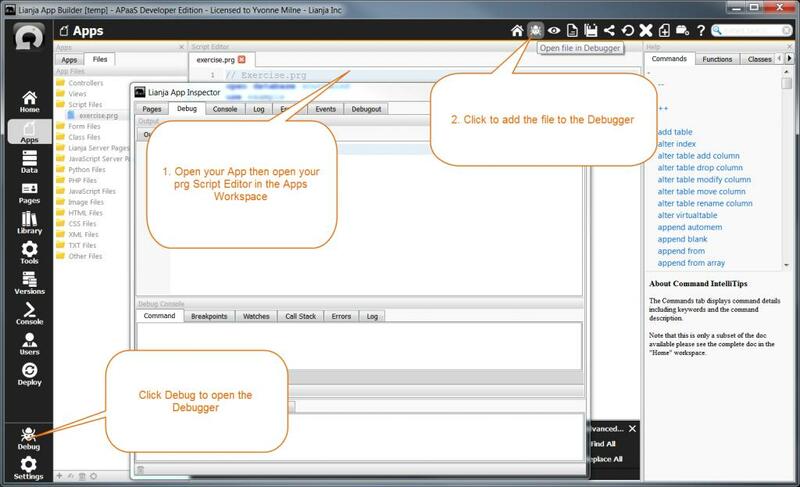 Try restarting the Lianja App Builder using the –reset command line switch, then reopen your App. If reopening your App causes the crash again, please package it and any required data and attach to the ticket. Then use the Versions workspace to restore a previously saved version of your App. It works fine in the App Builder, but does not work when I deploy it and place in the working area. Try adding the –debug switch to the Lianja App Center shortcut command line, then check the debug_clientXXXX.txt file in drive:\lianja\debug\. Right-click in the panel and choose ‘Inspect’ and see if any (red) errors are reported in the Console. This works fine in my application. But it looks like the it is not picking up both lines when I try to test it in the app inspector or console. You can only issue single-line commands in the Console/App Inspector Command Windows. colDefSql = columnName + " char(36) not null"
in the Lianja/VFP command window in the Console or App Inspector before running your code, you can check lianja\debug\debug.txt for errors. That looks to me like the ‘’ string delimiters are being retained and the data type clause therefore not being recognised. I’m not sure if that’s an invalid parameter use or whether this should be handled. if you find any bugs in Lianja please let us know by submitting a ticket at http://www.lianja.com/support/newticket (Sign in to submit a ticket). Please include detailed steps to reproduce the problem. Any required App(s), data and Library files should be attached to the ticket. These can be packaged into a Lianja Package File. Send cut-down versions of your data where possible – you can create a backup copy for your database in the Data workspace, remove tables or records that are not required for the ticket, then restore your backup. If you can reproduce the problem using the sample southwind database, then even better. If large files are required to reproduce the problem – the maximum ticket attachment size is 20MB – please contact support@lianja.com to request an ftp login and instructions on where to upload the files. If you have more than one problem to report, please submit an individual ticket for each one. On the client machine where you have run your installer, have a look at the drive:\lianja\log\log.txt file. This will include the dataDirectory and other directory settings it is using. Check that this directory contains the databases that you are expecting. This will then output debugging information to the debug.txt and/or debug_client.txt files in the C:\lianja\debug directory. improved the debug error logging in 2.1 to hep you pinpoint hard to find errors. The debug.txt file is now versioned for each run of the App Builder or the App Center e.g debug.txt becomes debug_.txt where is the process id of the running executable. Same goes fro debug_client_.txt. You may want to purge these files periodically. In Lianja App builder when I click to open ‘Lianja Demo App’ it seems that it tries to open it as indicated by a progress line bar on top bar but it closes the App builder without any error. 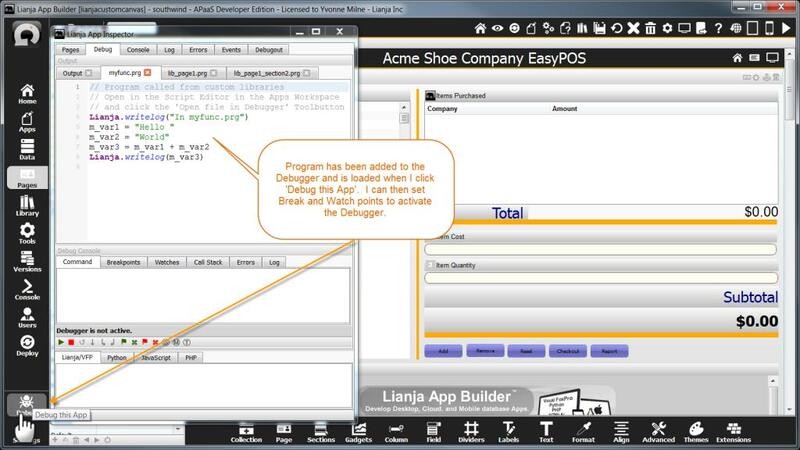 1) set debug on, from the console, before you open the Lianja Demo App. 2) go to the debug directory (under Lianja), and open debug.txt. Hint: get Notepad++ and leave that file open. That way, when you click on it, Notepad++ will tell you the file has been modified by another program, and ask whether you want to refresh the version. This way you don’t have to go click on it every time. and you will get a line-by-line recitation of what fired in what order. And where it stopped firing. 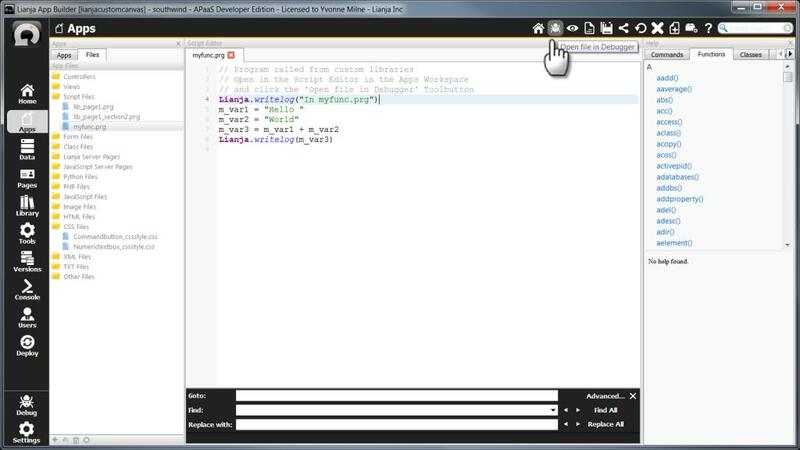 1) compile all your prgs with the debug keyword. You will then be able to see what is taking time when you open your app. I think: I haven’t tried this when spawning an app. a note: when the JS debugger appears and has a permanent failure (this was a missing reference to the lib_xxx.js file), the rest of the app will be locked until you close the debugger. Makes sense, given that there is no place to go after that error, but could be confusing if you don’t realize it. You can run in “debug” mode and click on the message in the console which will take you to the line which is in error. 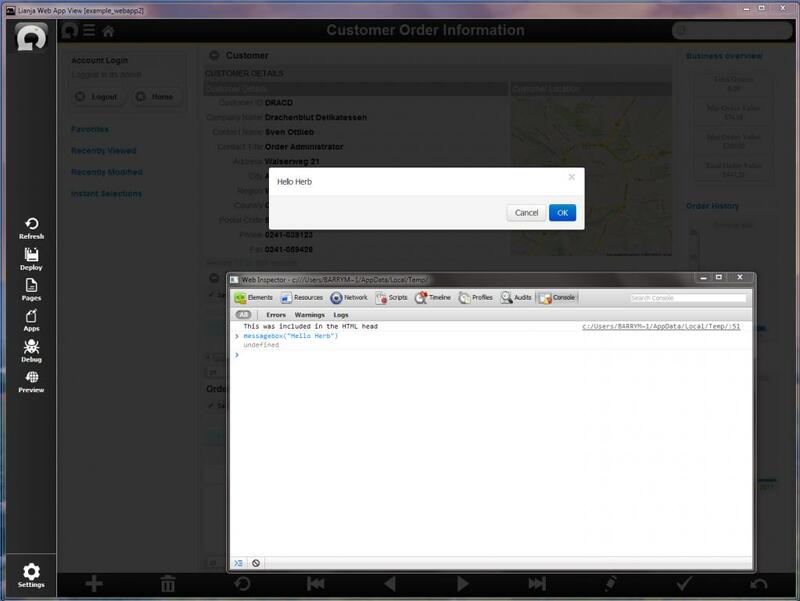 Also messageBox() in the web/mobile client is non-blocking and you are displaying it twice. If you *must* block the browser window with a modal dialog using alert(“some text”). 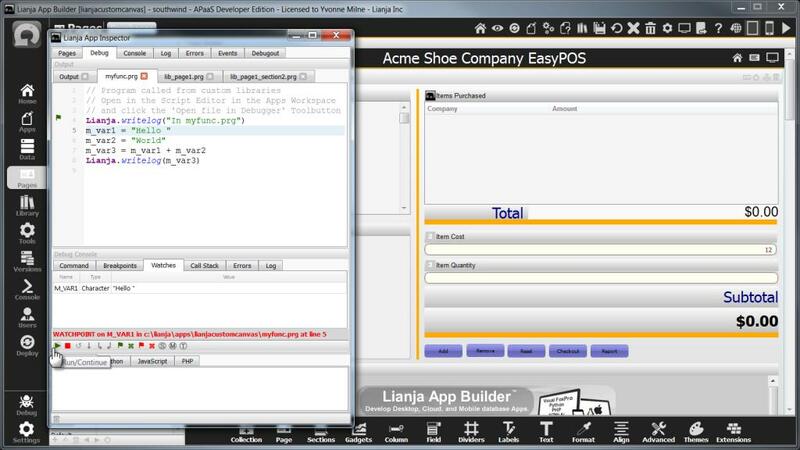 if Lianja cannot evaluate the expression in the client it will automatically try and execute it in the server. That error message is coming from the server. I clicked the ‘Web App View’, then the ‘Deploy’ option. Next, I clicked the Preview option and it opened in a browser. Clicking this menu item still didn’t seem to do anything. Press Ctrl+shift+i to open the Developer Tools, then select the Console tab and see if any error are reported when you click the menu item. I think this is a error occurs inside a try – catch VFP code. How can I see more detail? Issue the following settings in the Lianja/VFP Command Window before you open the App then check the debug files. 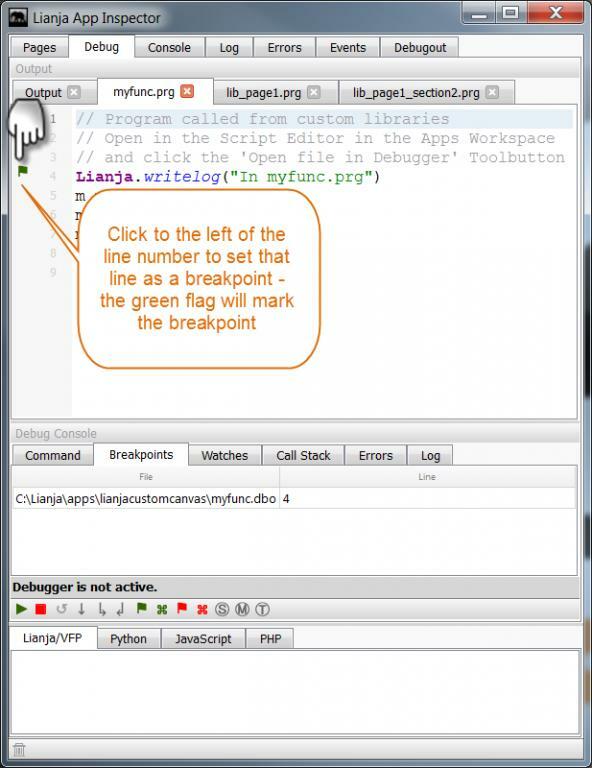 It’s possible to SET DEBUG ON and SET DEBUGTRACE ON when running from the App Center. Simply add it someplace like the Init delagate for the App. That way you’ll at least get the debug files. try deleting any .dbo files from your app’s directory and the ./library/ directory and see if that changes the behavior. Try adding a LIST STATUS TO FILE <filename> before the MESSAGEBOX() and see if everything in there is as you expect. Have you tried issuing SET DEBUG ON and checking the log in the ./debug/ directory for more information? Issue it in the console before you open your app. Can you switch to the lib_search.prg tab in the debugger? If there is an error in search.rsp, there should be an errorxxxx.mem in lianja\error. If you open the script in the Script Editor, you can click the Debugger button in the Headerbar to load it into the Debugger. 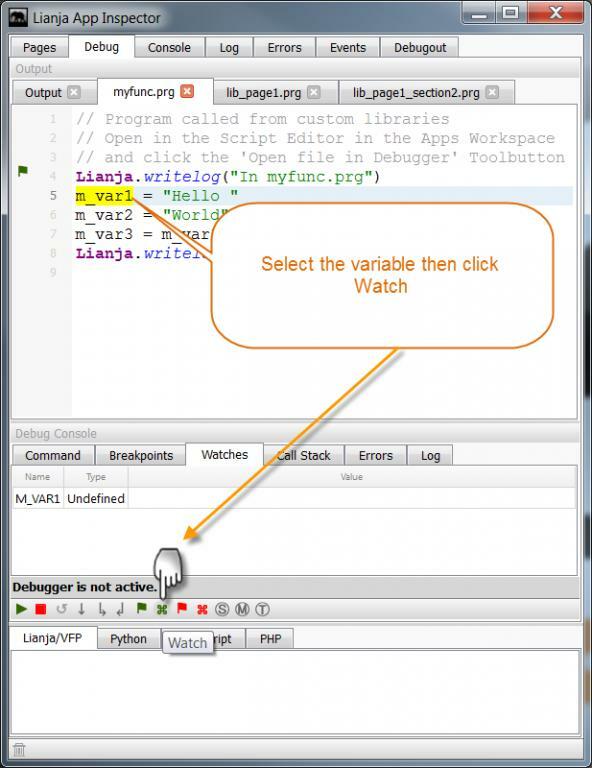 yes, the full Desktop App ‘Debug’ debugger is for debugging Lianja/VFP scripts. Then open an App and attempt an update. If you are debugging an App, just load the App and click the ‘Debug this App’ button in the ModeBar. This will automatically load any custom libraries referenced by the UI Controls. 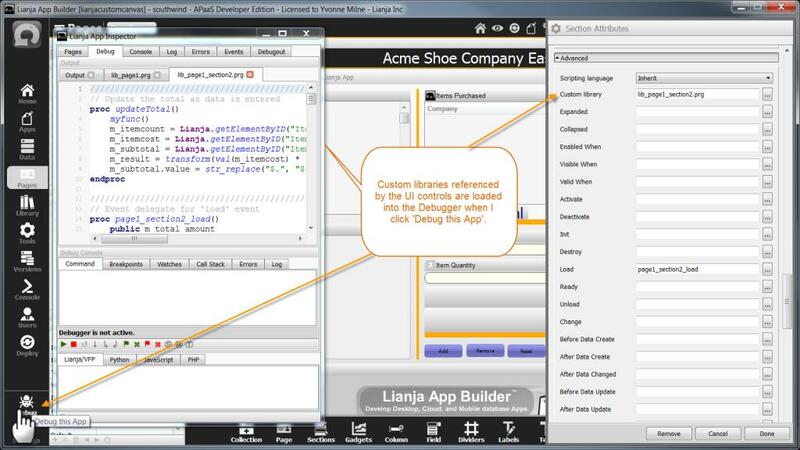 For example, in the lianjacustomcanvas App included in the Lianja App Builder distribution, the ‘page1’ Page references lib_page1.prg and the ‘section2’ Section references lib_page1_section2.prg. Now when I click the ‘Debug this App’ button in the ModeBar, myfunc.prg is also immediately available in the Debugger, not just when it is called while the Debugger is active and ‘Step Into’ used. With my ‘myfunc.prg’ program loaded in the Debugger, I can set Watch and Break points and continue running the App until one of these is reached. At which time, I can step individual lines, or click ‘Run/Continue’ so that the App continues until another Breakpoint or Watchpoint is reached. If my program file is named “exercise.prg”; then I must use debug excercise.prg? This is the equivalent of setting debug on from the Console Workspace in the Lianja App Builder, so check for any information logged into C:\Lianja\debug\*.txt. I should also mention that that will be a system-wide setting while enabled – so will also apply to a Lianja App Builder on the same machine. Then do your updates, exit the App Builder and have a look at the files in Lianja\debug to see if any errors are reported. Can you put a LIST STATUS just before that to show what tables are already open? Specify a target for the SELECT – at the moment it will just be going to the Console Output Window as standard output. 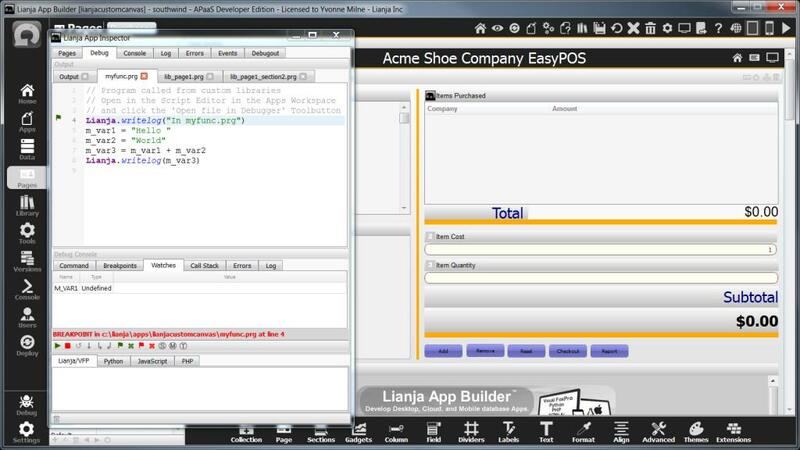 You can use Lianja.writeOutput() then open the app inspector, switch to runtime mode then look in the events tab and the output. when you SET DEBUG ON in the console, you can look in the c:\lianja\debug\debug_client.txt file which has a trace of all property set/get and method calls. It can help to identify problems. these will be included in the debug,txt file also which should help to track the problem down. then you can look in c:\lianja\debug\debug_client.txt to see if the events are being dispatched or not. Not wanting to sound like a broken record, but if you SET DEBUG ON and run you code then exit Lianja and look in the debug_client.txt file you will be able to see if the object was destroyed and the ActiveX destroyed alongside it. Try assigning .f. To it rather than .null. if you are having difficulties getting this to work then SET DEBUG ON and test your update. If it does not work look in debug_client.txt. If you can’t figure it out then submit a ticket attaching debug_client.txt, the output from LIST STATUS in the console and your delegate code that is performing the update. Open up the App Inspector and watch the events at runtime when you open the App with Lianja.openApp(). The console is designed to run interactive single line commands. You will now be in the script editor where you can type in as much as you want. You can’t debug complied server pages which is what you are trying to do. Server pages ( .rsp pages ) are just in time compiled producing a .rso object file which is executed. Ok so that’s a virtual table you are relating to? will tell you the alias names which are referenced in the relationship and show you the column names. Look in the console and see if there are any errors, also LIST STATUS will show what indexes were created to handle the related sections. In most cases I have synonyms for them so messagebox() and messageBox() both work.